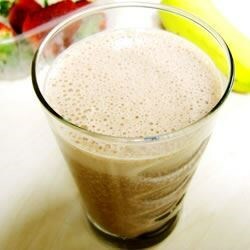 In a blender combine milk, frozen strawberries, 1/2 banana, chocolate milk powder, vanilla and sugar. Blend until smooth. If consistency is too runny, you may add more strawberries. It was good but not that great. I added more strawberries and more vanilla extract for more taste. My family really enjoyed this milkshake. It is filling enough to satisfy the kids after a day at the pool, or as an afterschool snack. I use ovaltine mix as it was what I usually have on hand. Quick and very easy recipe. It has a good texture and tastes great! Really yummy! I made this for breakfast using sugar free Carnation Instant Breakfast. I've also used Ovaltine. Thanks Denise! This recipe was great. I didn't use the banana so it had more of a strawberry flavor, but it was very good.